I am assuming that if a verb has the II Aor it has II everything else. Thanks a lot! e.g. ποιῶ (instead of Ionic ποιέω). Children always learned/learn real words related to real situations. They never consciously "parse words" in talking to themselves, though they learn fairly quickly to choose the correct forms for the correct situations. You should also have access to tables that will help you see and check the correct forms and that will also lead you to the correct idiomatic voice for a given vocabulary item. See the Greek Morphologia, available at http://www.biblicallanguagecenter.com. It has about two hundred of the most common verbs and patterns listed for you in complete tables for a particular voice of a particular verb (not limited to accidental occurrence of NT forms! ), along with a helpful English to Greek index (including some necessary/common words not occurring in NT), and all the noun/adj patterns collected at the back. There are also summary tables at the back of Living Koine Greek 2b that show the different kinds of aorist actives on one table, or the different kinds of perfect middles on one table, etc. In your table you listed the 'subjunctive' (ὑποτακτική) ποιῶμεθα "we should be doing," instead of the 'indicative' (real statement ὀριστική) ποιοῦμεθα "we are doing." Just keep going foward, you are doing fine. Language learning is an upward spiraling affair. I will try to paste a page from the morphologia book that has two tables, ποιεῖν to be doing (active) and ποιεῖσθαι to be doing (middle). I will try to paste from a PDF in order to preserve formatting. . . .
Looks alot smaller, but maybe that's just my machine. How does one use such a table? 1. for reference one can check and see how the verb handles something or how it appears in a particular form. This is always useful for adult learners. 2. One can bite off a small piece of the paradigm and play with ONLY that piece. E.g. "I was doing, you were doing, he was doing." Use only that piece in multiple situations and communication. Let the accent pattern sink in deeply, with twenty different usages and examples. 3. Only then, if one wants, try connecting to another small piece. Like jumping from 'I was doing' to 'I am doing', again in appropriate contexts. Listen to the accent shifts. Memorizing whole paradigms is not the road to fluency, although with fluency you will be able to generate the paradigm, at least as far as the language is internalized. Thank y'all a lot. I'm having a little bit of trouble trying to understand these charts, but I'll try to work on it. RandallButh wrote: Memorizing whole paradigms is not the road to fluency, although with fluency you will be able to generate the paradigm, at least as far as the language is internalized. Totally agreed, I formed this paradigm after finishing Mounce's set of chapters on the indicative and memorizing the list of augments, conn. vowels, etc. for each tense. ow I just need to see where I was wrong and correct it then do it for αγαπαω (Alpha compound) πληροω (omicron compound) λυω (idk the technical name, ending in non-liquid that will not change by touching vowels) μενω (liquid) and βλεπω (ending with consonant). Am I missing any that I should do to see how different root/stem endings interact with the conjugations? After spending an hour or two putting together that chart and then typing it, I understand how all the tenses relate WAY better. Both of these statements make sense to me. Writing these tables out really makes it easier to understand how the verb works, and helps you read. If you want to get fluent in Greek (something I'm still working on), then reading, writing, listening, and speaking are all important. I've been doing this to prepare for classes, and I find it has helped my fluency significantly. RandallButh wrote: See the Greek Morphologia, available at http://www.biblicallanguagecenter.com. It has about two hundred of the most common verbs and patterns listed for you in complete tables for a particular voice of a particular verb (not limited to accidental occurrence of NT forms! 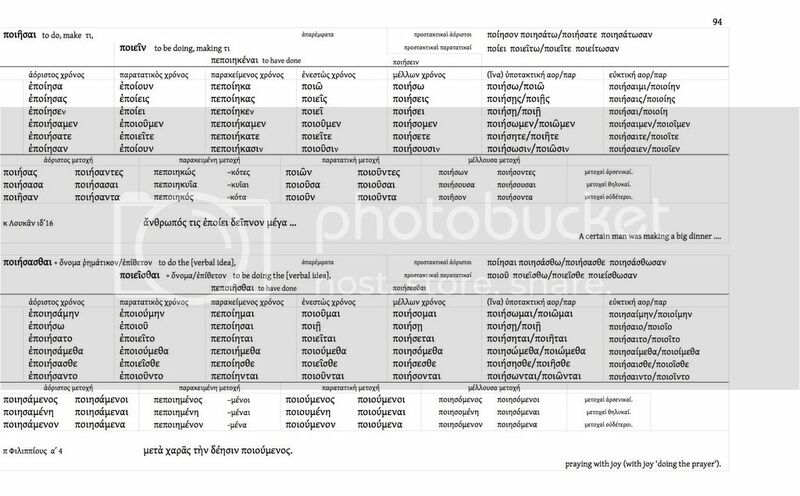 ), along with a helpful English to Greek index (including some necessary/common words not occurring in NT), and all the noun/adj patterns collected at the back. RandallButh wrote: How does one use such a table? RandallButh wrote: I will try to paste a page from the morphologia book that has two tables, ποιεῖν to be doing (active) and ποιεῖσθαι to be doing (middle). I will try to paste from a PDF in order to preserve formatting. . . .
παρακειμένη μετοχή – Perfect Part. παρατατική μετοχή – “Present” Part. μέλλουσα μετοχή – Future Part. You might try thinking of the Indicatives as I describe them to my students. As a short cut term, we call a form such as εποίησα “Aorist.” But the way we THINK of that form is "ἀόριστος ὄψις καὶ ἐχθές” (Aorist in aspect and yesterday, that is, in the Past time).” Likewise ποιῶ is παρατατική ὄψις καὶ νύν (Ongoing aspect and now, that is, in the Present time). “Present” is a particularly misleading term. A “Present” Participle, for example, has nothing to do with the Present time. παρατατικός (ongoing, extending) is a fine term to add to your thinking about the Greek verb. Verbs are idiomatic in their choice of [voice] διάθεσις. That is why the Morphologia tables are specific to voice for each verb. Some voices are not used by a verb, or very rarely, and others will skew the meaning enough between voices to cause a learner to miscommunicate. Others will shift voices in different tenses. ἀνίστημι I am raising something up, making something stand up. ἀνίσταμαι I am standing up. But ἵστημι I am setting something up and ἕστηκα I am standing (active perfect!). All little Greek kids thought that was the normal way to talk. Go figure (tongue in cheek)! I recommend that a learner learn each new verb in an appropriate voice that is correct to desired or common contexts.